Recently, I had the opportunity to travel to Madison, Wisconsin, for my regular Richie fix. Richie is Dr. Richard J. Davidson, the Founder & Director of the Center for Healthy Minds at the University of Wisconsin-Madison. He has devoted his career to researching the science of well-being, and he posits that it is a skill which can be learned and cultivated, like playing the piano. Pretty exciting and affirming, no? Richie had just returned from Silicon Valley, where he was consulting tech CEOs on how to make our devices more compassionate. Then from Silicon Valley to Dharamshala, India, on the edge of the Himalayas, visiting his good friend and mentor, the Dalai Lama. A few days upon his return, Richie was oozing extra good energy during his talk, "The Pursuit of Happiness," the highlight of which was when he led the group (a few thousand of us at Madison's Museum of Contemporary Art) in a loving-kindness meditation. You could hear a pin drop during the impromptu session. It was amazing! Happiness is a disposition that allows us to be as good as we can be. Richie said we are born with innate basic goodness, and that we are born to be happy and free of suffering. At our core, we all have this one thing in common. We all share the desire to be happy and to reduce suffering. Once we accept and embrace that fact, we can have more empathy for those around us. Being good and being happy are highly correlated. He mentioned a study (I'm paraphrasing but you'll get the gist of it) where subjects were given money to spend on themselves, and another group was given money to spend on others. The latter group registered higher levels of happiness, which supports the idea that giving back to others, doing good, delivers an ROI that's greater for you than operating in a silo of self. Research shows meditation has tangible physical benefits for our brain. It slows down the rate at which the brain ages, and certain types of meditation (loving-kindness, also called compassion, meditation) are anti-inflammatory. That being said, when asked what the "best" meditation practice is, I loved it when Richie said, "The best kind of meditation is the meditation that you do." Find what practice resonates with you and stick with it. If we have the capacity for awareness, we have the capacity for well-being. Meditation increases meta-awareness, which is monitoring your own mind, i.e., reading a book and then realizing you have had zero comprehension of the last 5 pages. It also fosters resilience, which is the rapidity from which we recover from adversity. Fear contracts awareness. Richie explained that fear is inherently biasing because the focus is on one trigger, not the full and complete picture. The more awareness we have, the less we are driven by fear. He also suggested Dan Gilbert's book, Stumbling on Happiness (Gilbert, also a Harvard-trained psychologist like Richie, also has a Ted talk about the surprising science of happiness), which claims that the ideas we have about what will make us happy are inaccurate. Material possessions don't cut it. Richie closed with a somewhat radical message in this day and age, which is that we need to be motivated by love, to get past the anger, and that we need to talk with people across the spectrum to bridge differences. That message is especially timely now, with the 50th anniversary of Martin Luther King Jr.'s assassination in two days. As Richie said, "Martin Luther King's speech was not 'I have a nightmare'." It was a poignant reminder that need to stay true to our dreams, values and ideals, and keep hope alive. Richie closed with an invitation - to meditate every day even if it's just for 1 minute. Try it! He commented, "Our brain is our most treasured organ, and we treat it so inappropriately." Just like we are mindful of our bodies, and the food we ingest, meditation is a critical tool for taking care of our brains. It doesn't cultivate itself. He continued, "There's nothing magic about this. If you don't go to the gym, you'll get out of shape. It's the same with mental training and well-being." This Spring, as we think of gardening and blooming flowers, you have the ability to "plant seeds" in your own brain. We encourage you to try it and notice the changes. If you need a boost or gentle nudge to get started, we can help! Drop us a line at info@mybreathebar.com or check out our Resources page. Happy planting! Editor's Note: Sylvia Maldonado, pictured below with Dr. Richard J. Davidson, is the Founder of breathe bar. As January has ended seemingly in the blink of an eye, we may wonder where our time is going, and how to can possibly accomplish our goals, set our intentions, and do all the things we want to do. As we focus on doing, try to take a step back and think about you, in the present moment, just being. It is so easy to get swept up in the wave of to-do lists and schedules (as a former TV producer, I thrive on lists and deadlines). Especially at this time of year, many of us take stock of our lives and resolve to set new goals and intentions for change. So often, these best-laid plans are derailed due to impatience or expectations (sound familiar?). In short, impatience and expectations are a few reasons why I meditate, to balance out those natural inclinations to want what I want when I want it. While we may strive to accomplish our "end game," the more we focus on what we can control vs. what we can't control, the happier we become. It’s no surprise then that the most effective way to usher in change is to do so consciously – using mindfulness. By making the choice to shift to more mindful attitudes, we can begin to break old patterns and cultivate long-lasting change. So how do we begin? Choose fluidity instead of rigidity. Or: be like water. Be open to the reality of the present moment – its peaks and valleys, the possibility for failure (a note on failure - a friend says that she doesn't fail, she learns. I couldn't agree more) and the potential for success in any given situation. In this way, we become more fluid, more resilient and far less likely to give up at the first hurdle. Choose self-compassion instead of self-criticism. Or: show love to yourself. A kind inner voice that supports us, rather than judges us, is far more likely to elicit our motivation to grow and change. Though it is so easy to fall into negative self-talk, consciously stop yourself from going down that road and choose a new script. Choose value-oriented intentions instead of all-or-nothing goals. Or: don't throw out the baby with the bath water. Too often, when our plans hit a detour, we give up altogether instead of recognizing the progress we made. This behavior sabotages our efforts. Mindfulness can help us both make and follow through on such resolutions, as well as provide strategies that help us more effectively handle the stresses and challenges that often derail resolutions. Choose to be proactive instead of reactive. Or: Tame your fight-or-flight response. One of the most effective ways to literally change your brain is meditation (check out this Harvard study). Develop or reignite a regular meditation practice. When used reactively, mindfulness can only help in the heat of the moment, but when used proactively, it guides our thoughts and actions before the problem even becomes a problem. Now that your desire to start/ ramp up your meditation practice is (hopefully) piqued, how do you get started? If you're like me when I was starting my practice, you need a teacher to sit you down and guide you through the process. If you want to dip your toe in the water first, no worries, check out these resources. As Carl Bard said, "Although no one can go back and make a brand new start, anyone can start from now and make a brand new beginning." Sylvia Maldonado is the Founder of breathe bar. Editor's note: Private meditation sessions are on sale the month of February 2018! Click here to purchase. As Thanksgiving approaches (it is tomorrow already, where has this year gone? ), I'm so thankful for breathe bar and the experiences it has provided to me. The inspiration for breathe bar was born at a retreat at the Shambhala Meditation Center in Colorado in the Fall of 2015. The retreat was a transformative experience, not only because it allowed me to go deeper in my meditation practice, and for providing the seeds for breathe bar, but also because I met a fellow meditator who would become a dear friend, Trish. We would chat meditation, movies and everything in between before and after our sitting practice. At the end of the retreat, I gave her my scarf as my ode to the Sisterhood of the Traveling Pants (corny, I know, but it worked), with the plan that we'd meet up for future travels. The scarf has served us well. Trish came to Chicago for breathe bar's launch, and we just attended the Real Love retreat with Sharon Salzberg at Upaya, a Buddhist meditation center in Santa Fe, NM. If you're not familiar with Sharon's newest book, Real Love: The Art of Mindful Connection, I highly recommend it (Real Love and Faith are my favorite Sharon books). She presents practical and helpful tools for taming our inner critic to cultivate love for oneself which I have found invaluable. Sharon's co-presenter was Joan Halifax, an accomplished author in her own right who shares a 40-year friendship with Sharon. Seeing the chemistry and deep bond between them was the best example of real love in practice that I have witnessed in a long, long time. It was wonderful to see. Trish and I met two other meditators on the retreat - a couple of longtime friends, Andrea and Carol, from New York. They are a warm, fun, funny and wonderful pair I'm grateful to have met. The Sisterhood is expanding! Funny how meditation brings people into your life whom you're supposed to meet - like-minded souls who are with you on the path. While driving from Santa Fe to Sedona, I mentioned in passing to Trish that going to the national parks are on my bucket list. Trish asked, "Have you ever been to the Grand Canyon?" When I said no, she said, "Let's go!" so we made a spontaneous side trip to the Grand Canyon. Pretty cool to say the least. Its majestic beauty is awe-inspiring and breathtaking. We arrived at sunrise. To see the sun highlighting the beautiful colors of the canyon is a memory that I will never forget. We followed the photographers to try to get the best vantage points. They were fearless hanging over the cliffs to get the best shot. Heading back to our car, we saw a herd of darling deer ambling along the path back to El Tovar (eat there to enjoy scenic views of the Canyon). Then as we were heading out of the park, I saw an elk that was so still and majestic, I thought it was a statue. Trish assured me it was the real deal. I couldn't imagine a better visit to the Grand Canyon. Thank you, Trish, for being an amazing tour guide and even a better friend! We capped our trip with a visit to Sarah McLean in Sedona, AZ. Sarah's McLean Meditation Center is in the heart of town and is a reflection of Sarah's warm energy and dynamic spirit. After months of emailing, it was a pleasure to meet her face-to-face. I have been impressed with graduates of her Meditation Teacher Academy, which is her 200-hour meditation and mindfulness teacher training program. Sarah is also in the throes of developing her Mindfulness@Work Teacher Training Program. It is for those who are already certified meditation teachers and who want to specialize in the workplace wellness track. Thank you, Sarah, for making the world a kinder place! As I write this, I am with family enjoying a warm and sunny day in Dallas, TX. I am so thankful for dear family and friends, and for you, my breathe bar family, this holiday season. I wish you many blessings this holiday season and always! My first memory of struggling with depression dates back to when I was sixteen. Anxiety - that was much earlier - probably in middle school. Hating my body? That started when I was four years old. I remember being in Kindergarten and comparing myself to my classmates and best friends and repeatedly telling myself I was fat, unworthy, awkward, and alone. I remember being in dance class and avoiding the days we were measured for costumes because I was so ashamed of my size. The saddest part was, I was the exact same size as everyone else around me; it was just my mind convincing me I was not. The end of high school and all throughout college were when anxiety, depression, and my eating disorder picked up in full swing. But, up until my sophomore year in college, I kept everything a secret. My parents were going through a messy divorce. I was miserable during my freshman year and decided to transfer schools. All the while, I was putting a smile on my face. I didn’t want anyone to know I was sad. I felt so, so much shame about how I was feeling, and thought I was weak for struggling. The problem with any mental disorder is that the stigma is so great around them in our society, that it leads us to believe that we’re doing something wrong, that we're bad for feeling how we feel, that we don’t deserve to feel this way because we were fortunate growing up, or that we should be ashamed of how we’re feeling. This only reinforces the silence. So, I turned to restricting food as my coping mechanism for feeling depressed, because it was the only thing I could control. And, eventually, that silence and depression became too overbearing, and turned into a suicide attempt. For the past two years I have been through all levels of treatment, from hospital stays and residential programs to a partial hospitalization and intensive outpatient program to outpatient therapy to get my weight to a healthy place and my mind as well. I spent the first year of treatment simply going through the motions. Show up. Eat the food. Get through the night without doing anything too self-destructive. Show up the next time. For months this was my life, and although I was restoring weight and learning skills, I was so deeply depressed that I couldn’t look a day into the future. Nearly every day, the therapists and I would safety plan how to keep me alive until the next day of programming. Needless to say, it was exhausting. Is recovery worth it? Is living another day worth it? Am I worth it? Self-worth, or my lack thereof, has always played a role in my life and the way I view myself, from self-sabotage and beating myself up, to the way shame washes over me when I make a mistake or embarrass myself. Something I always remind myself when I’m getting wrapped up in a shame spiral is shame researcher and bestselling author Brene Brown’s quote, “Shame needs three things to grow: secrecy, silence, and judgment.” That, and, “shame cannot survive being spoken. It cannot survive empathy.” Now when that shame starts to wash over me, I always try to channel my inner Brene Brown and speak that shame to stop it from growing. In learning to do so, it has opened the doors to finding connection, authenticity, and most importantly, hope. If you’re ever feeling hopeless, are losing hope, or need that extra nudge of encouragement, know that hope is still alive for you whether you’re holding it, a therapist is holding it, your friends and family are holding it, or anyone that is going through a similar experience is holding it. I’ve learned that the people who help you the most are the ones who have lived a similar journey, and have come out on the other side to prove recovery is truly possible. -Take action! Whether that be by calling your representative to increase funding for mental health research and treatment, or advocating alongside organizations like NAMI, NEDA, Project HEAL, AFSP and others, your voice matters. As for me, it wasn’t until this year that I found true reasons to recover. For the first time in years, that heavy, overbearing darkness was lifted and I didn’t walk around barely able to make it to the next day. The people who have helped me the most on this journey are the members of my treatment team that opened up and shared, “I was once in your shoes.” They inspire me every single day and are living proof that recovery is not only possible, but so is using your own recovery to help others. For the past few years, my team has repeatedly told me they’re holding hope for me when I can’t hold it for myself, and from that I’ve learned to put all my trust in them. There are so many times that I’ve given up on myself, but they’ve held onto hope and reminded me I’m worth it. And ultimately, that’s why I’m still here. Don’t give up. You are so enough. Editor's Note: October 10 is World Mental Health Day. Thank you to our former intern, Emily, for sharing her story and inspiring hope. Meditation is an essential tool for top-performers across all industries, including professional sports. Darnell McDonald, a former Chicago Cubs player, is now the mental skills coordinator for the Cubs, teaching players how to meditate and improve their mental game. George Mumford, the best-selling author of The Mindful Athlete and a psychologist, has taught meditation to some of the most famous athletes in the world, including Michael Jordan, Kobe Bryant, and Shaquille O'Neal, to name just a few. An aspiring professional basketball player himself, Mumford's dreams were sidelined by injuries which led to drug addiction. In his recovery, he discovered meditation, and was able to combine his passion for sports with the mental training that meditation provides. So why is meditation so beneficial? Just as we know we need consistent physical activity for optimal health, our brains need training to operate in peak performance. 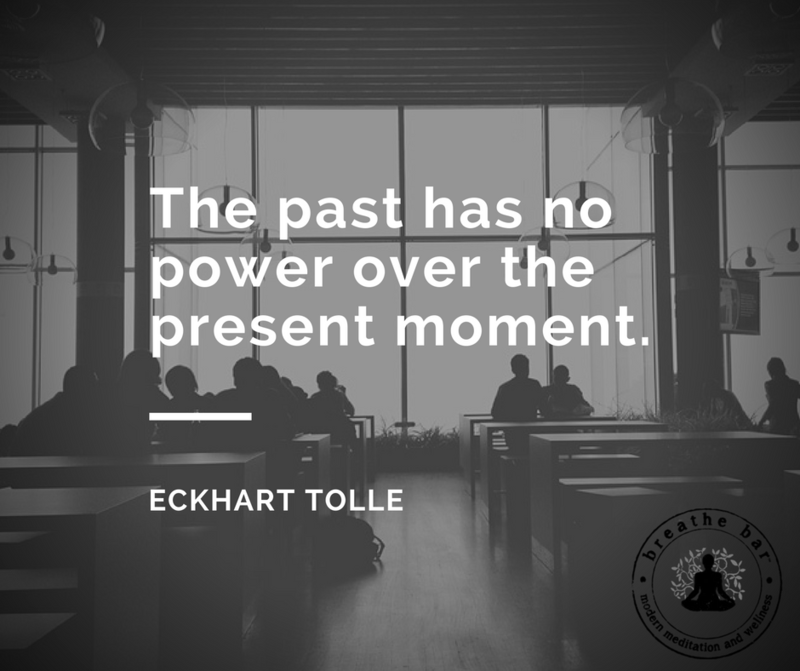 Mindfulness, a type of meditation, teaches us to operate in the present, to not dwell in the past (i.e., don't dwell on the bad play) or worry about hypothetical future-based scenarios. It teaches us to be non-judgmental, and to foster non-attachment, an attitude that enhances our ability to be resilient when we get outcomes we weren't expecting. These are great principles to live by for athletes, and for non-athletes alike. The research is ongoing, but so far, neurological studies show promising results for meditation's ability to lower depression and anxiety, improve focus and concentration, enhance happiness levels and well-being, and increase compassion through loving kindness meditation. Recently, the American Heart Association became the first professional medical society to issue a statement concerning meditation's benefits, stating it may be effective in reducing heart disease. Even better, it doesn't require any special equipment, clothes or props, and can be done anywhere, anytime. So how can you incorporate meditation into your daily routine? Much as you hire a personal trainer to work on your fitness goals, work with a trainer for your meditation practice. It is a skill that needs to be learned then practiced, just like playing tennis or the violin. Don't get discouraged if you don't pick it up right away. Like anything else, it takes time. Stick with it, and remember, there is no right or wrong way to meditate. You will have thoughts, and that's okay. Release them into the sky like a balloon and return to your area of focus, whether it be an image, your breath, a sound, or a mantra. Find a resource to help you learn the best meditation practice for you, and start small. A consistent practice, even 3 minutes a day for most days, is more beneficial than an hour a month. There are several free and low-costs meditation apps (we like Aura, buddhify, and Insight Timer) you can try. Meditation classes are offered at studios popping up all over the country, as well as at many yoga studios. For those of you who like the personal trainer approach - I certainly do! - there are even meditation teachers who will even come to your home or work through breathe bar. There is no time like the present to get started! You'll be glad you did. Editor's note: For all the athletes, and non-athletes, looking to be matched with the right personal trainer, who will come to your home or work for a session, check out RightFit Personal Training. You'll even get a free introductory session to try them out! A few weeks ago, my yoga instructor and I made a commitment that I was going to start meditating every morning. It worked well on the weekend or days I didn’t do much because I could choose to meditate at whatever time I woke up. However, on the days that I had to get up at 6am for work, I wasn’t too pleased about it. On the first early morning, without even thinking about it, I skipped the meditation. I got up, got ready, and drove downtown. As I was walking out of the parking garage with my phone and headphones in hand, I paused. I said to myself, “No, I’m not going to use my phone on this twenty minute walk” and began my trek down Michigan Avenue. I decided to be really mindful instead. I noticed all the beautiful flowers planted along the street, something I never pay close attention to. I know this walk like the back of my hand, but usually I’m listening to music or responding to texts, completely unaware of my surroundings. I noticed a new store that opened that I had never noticed before. I became aware of all the people I passed, and how so many of them were multitasking and on their phones. I paid attention nonjudgmentally to them, rather than comparing myself to each person I passed and telling myself they’re skinnier, taller, blonder, pulling off an outfit I’d never let myself wear. I noticed the pace I was walking. Usually I speed walk everywhere but this time, even when I’m not in a hurry. Today, I slowed down. I didn’t cross streets when there was a break in the traffic for me to run across even though the walk sign was off. I realized how often I body check and look at myself in the window reflections. It’s so habitual for me, I’m not even aware of doing it until I stop and pay attention to it, like I did today. Twenty minutes later when I got to work, I didn’t feel a sense of anxiety or panic or feel tired from walking so fast. I sat down, drank my Starbucks refresher, and started writing about my mindful morning. Mindfulness and meditation doesn’t have to be seated on a cushion in silence for thirty minutes. It can, and I love doing that too, but you can be mindful anywhere, and that’s often a good place to start. Walk your dog and leave your phone behind, cook dinner mindfully, notice your surroundings next time you take a coffee run. Take in the world around you because chances are, there are things you’ve never noticed before. Editor's note: Emily Rutherford is part of breathe bar's social media team. She is a student at DePaul University studying journalism and psychology. Beginning my meditation practice didn’t happen all at once. Around two years ago, I started using meditation to calm my anxiety. I found it hard to sit still for longer than five minutes, and always felt like I was doing it “wrong”. Like many of us, I thought I would close my eyes, my mind would go blank, and I’d feel instant peace. I felt like I was meditating wrong. As my knowledge around mindfulness grew, I learned that there is no “wrong” way to meditate. Meditation is about noticing what comes up in that moment, and taking a step back from it. Instead of being immersed in that thought, imagine yourself as an outside viewer to it. It is about doing your best to keep a nonjudgmental stance - to defuse from your thoughts, so that instead of telling yourself, “I’m fat and a horrible person,” you tell yourself, “I’m aware of the thought that I’m fat and a horrible person.” It takes you out of the heat of that thought, and allows you to acknowledge it and let it go, and then you move on. Sometimes thoughts that don't serve us pop back up - they often do - but again you notice them, and let them go. Just like any other practice, meditation takes time. It wasn’t until last fall when I went on a four day meditation retreat for a class at DePaul University that I really connected with meditating. Also around this time, I was picking up my yoga practice again, attending classes two to three times a week. This is when I began feeling that “meditation high” - I would come out of a practice and feel washed over with new energy. I felt refreshed. My mind wasn’t as foggy and my attention wasn’t as scattered. I felt lighter and happier. Happiness goes up and I feel better - that is why I meditate. Visualizations have helped me learn to meditate, by imagining my thoughts as leaves on a stream or on a cloud. I watch them go by, and then they disappear. It may sound cheesy to do, but it helps you realize your thoughts don’t control you. You are in control, and you can choose to listen to that self-defeating thought and believe it to be true, or let it ride down the stream, out of existence. My favorite type of meditation is a body scan. I find those to be the easiest way to stay present, as you move through your body from head to toe, connecting with each part. As you work your way through the scan, you feel your body loosening up, and letting go of the tight, rigid grip you’ve come to hold so well. 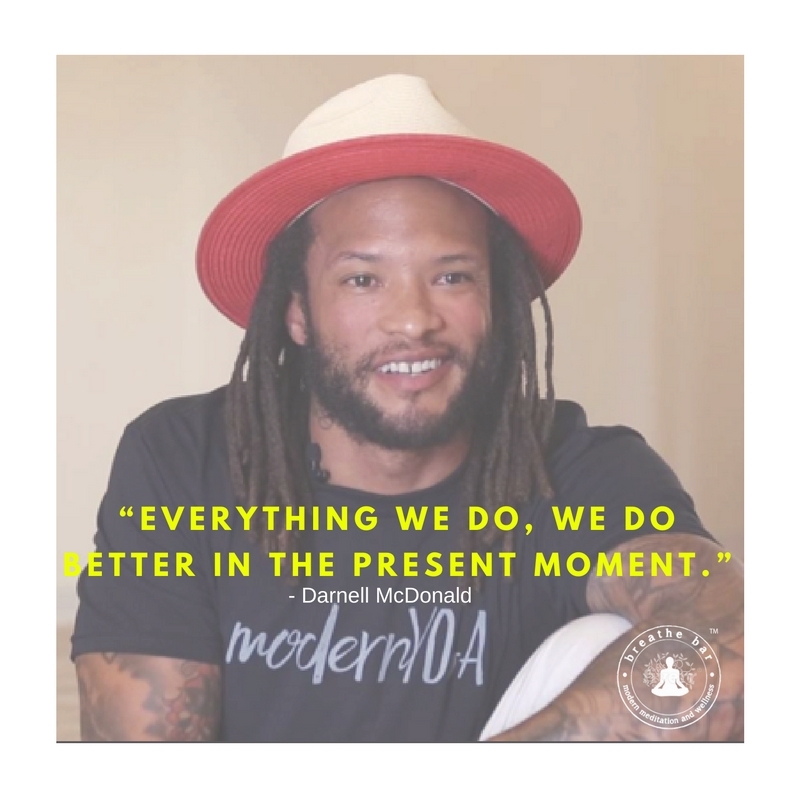 My favorite mantra is “just this one moment.” When you inhale, you say to yourself “just this one” and on the exhale, “moment.” It helps keep your mind focused by driving it not only to your breathing pattern, but to the words going along with it. And, the mantra itself is all about taking it one moment at a time. And that’s what meditation is all about. Just this one moment. 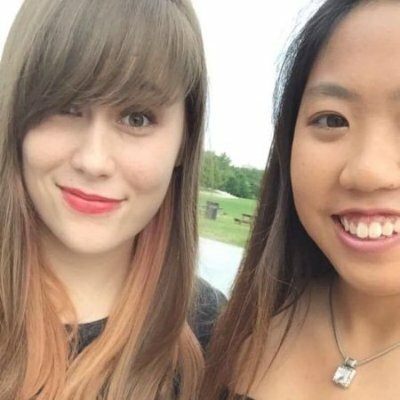 Editor's note: Guest Contributor Emily Rutherford is an undergraduate student at DePaul University studying psychology and journalism. She joined the breathe bar's social media team in May 2017. We are lucky to have her! 1. Sign up for a ‘Mindfulness 101’ class. If you take 4 classes this month, you receive a free on demand session to meditate on-the-go in our compassion corner. 2. Read a book about meditation. 3. Start a meditation group. breathe bar is happy to host you! Email us at: info@mybreathebar.com to get started. 4. Gift yourself private meditation instruction. We offer 1-on-1 classes to customize a meditation plan just for you. 5. Gift 2 friends a meditation class or book to share the love, and support their practice. Our Friends & Family membership helps you meditate together. 6. Commit to a regular practice in May – – once a week, twice a week, daily. Set the intention and then do it. If you stumble, be gentle with yourself and just pick it up again. No judgment. 7. Recruit a friend to be your meditation buddy to keep each other accountable and share challenges, successes, and tips. 8. Try a different style – chanting or mantra or sound - or incorporate a new tool, such as crystals. 9. Get outside. Meditate in nature – a park, a beach, a forest, a field. 10. Study the science behind meditation. The Center for Healthy Minds at the University of Wisconsin-Madison is a great place to start. Good luck and see you on the cushion! Happy Humpday! Speaking of humps, one of the questions I'm frequently asked is how to get over the meditation hump and start a meditation practice. As with any new habit, I suggest starting small and building incrementally. For me, I started with a weekly teacher-led class at a meditation studio in New York back in 2011. Once I felt like I was in a groove with the weekly classes, I then committed to meditating 3 minutes a days at home, 3-4 days a week. I meditated on my own, focusing on my breath. If I wanted a guided meditation, I'd cue up an app, or listen to a few minutes of Jon Kabat-Zinn, the creator of MBSR (mindfulness-based stress reduction). His voice is very relaxing! I would sit in my dining room chair when I first got home from work, before I changed out of my work clothes and got into the dinner routine. Once I had that practice established, I then graduated to 7 minutes a day every day, and grew from there. Now I start and close my days with a sitting meditation. A dedicated sitting practice of any length is tremendously beneficial. Once you're on the cushion, you'll then see the benefits off the cushion, which is what it is all about. Living a mindful life. To get over the hump, I suggest the Mindfulness 101 classes (there is a 6-7pm class tonight with Marilyn Joy) and the Meditation of the Day (MOD) classes, as well as the 30-minute Rain Shining Light classes. Once you sample the teacher-led classes, you will learn which techniques works for you and then develop a home practice. You can also pop in for an on demand meditation session in our private breathe bar booth - mention this email and it's free. Email us (info@mybreathebar.com) if you have any questions about getting started! We have a few events coming up that we are excited to share. A 4-week series,Breathwork for Stress, with the knowledgable and esteemed GuruNischan Khalsa, is kicking off on Sunday, April 23. I've taken her Kundalini class since 2013, as well attended her 4-week series, so I know firsthand the power of her teaching. I'm grateful that she is kicking off our series at breathe bar. She is amazing, and quite techy. All participants of the full series receive a video recording of the class, which is a very helpful feature. We are also hosting a book signing for our friend Rachael O'Meara, sales exec at Google San Francisco by day and author by night. Her new book, Pause: Harnessing the Life-Changing Power of Giving Yourself a Break, was published last week. She'll be serving as our "pause instigator" and reading from her book. Bring your book and she'll sign it for you! As we embark on the new season of Spring, now is a wonderful time for "starting over." That was actually the name of a syndicated TV show that I was a producer for back in the day. It featured a rotating cast of 6 women of different ages & backgrounds living together in a house, working with two life coaches to achieve personal and/or professional goals, i.e. a 62-year-old grandmother trying to become a stand-up comic, or a young widow trying to find love again. One of the mantras of the coaches was "reframe" - the idea that a thought - any thought - is perceived through our own prism and perceptions, which we have the ability to change. We have the power to respond to those thoughts in a curious, non-judgmental way, or in a way that does not serve us (i.e. swirling in imaginary, future-based scenarios). This ability to notice my thoughts and not always react, but instead respond, by taking a breath and creating space, is one of the many reasons I love meditation and am eager to share it with as many people as possible. A way to get started is through the 5-3-1 practice, developed by our friends at the Center for Healthy Minds at the University of Wisconsin-Madison. This is how to start: Meditate for 5 minutes (setting a designated time to meditate - first thing in the morning, before the day starts - is the best approach for me). Set a timer. Sit in a comfortable position, on a cushion or on a chair, with your arms resting on your lap. Gently focus your attention (that's what meditation is - focused attention) on the in-and-out of your breath, a mantra, or an image (I like visualizing a white light above me, or being enveloped in white light). If you have thoughts, that's okay. Gently release them like a balloon floating into the sky and return to your meditation. Remember, there is no such thing as a "good" meditation or a "bad" meditation. The point is to dedicate time to your practice, and you'll see the benefits. It may happen quickly or develop over time. If you stick with it, I think you'll find your happiness levels and general sense of well-being increases. We are so grateful to host the Center's Founder, Richard J. Davidson, at breathe bar on March 30 for a talk over tea & cookies to learn about their latest research. Davidson popularized the idea that we can learn happiness and compassion as skills, just as we can learn to play a musical instrument, or train in a sport. Happiness, like any skill, requires practice and time but because we know that the brain is built to change in response to mental training, and is capable of a high degree of plasticity, it is possible to train our mind to be happy. Davidson has been influenced in his work by his friendship with the Dalai Lama. Good stuff! Members of breathe bar's Founders' Club are invited to attend this intimate gathering with one of the most respected and inspiring leaders in the field of neuroscience, meditation and well-being. Join us! It is with pride and deep gratitude that we announce that breathe bar will be officially making its debut on March 31st with a 6am sunrise meditation. Our new home is located in the heart of the West Loop at 946 W. Randolph, 2nd floor (above Starbucks), and we cannot wait to be a meditation oasis for those who live and work in Chicago. As many of you know, my family has called the West Loop home since my father started Randolph Street food wholesaler La Criolla in 1957. With the opening of breathe bar, I have the privilege of continuing a family legacy of 6 decades of business in the area. My meditation practice has influenced me in such a positive way, by enabling me to better manage my stress and increase my happiness, that I knew I had to spread the good news about meditation. I also knew that there was only one place - Randolph Street in the West Loop, close to the birth of my Papa's dream - to fulfill my dream of building a space to share the impact meditation can have on health and wellness. As we get closer to our March 31st opening, I want to express my sincere gratitude for all of the support and encouragement you have provided as this journey has progressed. It has meant the world to me and my team and we cannot wait to welcome you at breathe bar. There is a neon sign near the Chicago Brown Line stop that brightly declares “It Is What It Is.” It stares me in the face as I cross Wells Street and instead of snapping a photo for Instagram (hello, siren song of social media), all I can think when I see this pink light humming its message is that I don’t get it, that I don’t have anything in common with this sign. I have never, ever thought something “is what it is”. Things are bad or good, right or wrong. I find comfort in categories. I assign feelings to experiences as a way to navigate my way through choices, to make sure I am working toward the good and the right and away from the bad and the wrong. To ever face something with a neutral feeling, to declare it is what it is, blows my mind. I spend a lot of time and energy wrangling feelings and outcomes to land on what I have deemed the good, positive side of my emotional life- surely, I would never just settle for it is what it is because what I want it to be is good, happy...perfect. But here’s the thing: good and bad are not feelings. Neither are right or wrong. They’re judgments. I’ve long believed in the health benefits of meditating and after years of claiming I was going to start (because meditating is falls in the good category, right? ), I realized why I never have: judgment. Mindfulness is thought free from judgment so you can focus your awareness on being present. I can’t be mindful and reap any benefits from meditation because I am so busy judging the thoughts going through my mind, placing them in their respective categories, their nicely packaged homes inside my head. It’s a lot of work and, quite frankly, it is not serving me anymore. So instead of judgment, I’m choosing presence. I am choosing experience. Instead of "good", I’m exploring joy, pleasure, fulfillment, satisfaction, happiness- real, live feelings. "Bad" might actually be fear, pain, confusion, or grief. Those feelings are okay. On my journey to mindfulness, in my quest for meditation to have a place in my daily life, I want to be open to feeling the feelings for what they are so I can actually show up to my practice of mindfulness. I want to be present for the experience that is my life, and I have a feeling that the neon sign by the El is going to continue to serve as an unavoidable, bright reminder. Guest contributor Nina Foley is the owner of the Gardner Media Collective, a boutique marketing, branding and public relations agency based in Chicago. She's an avid runner, yogi, enthusiastic home cook and proud new puppy mom to Franklin. Editor's note: We couldn't think of a better way to kick off our Wise Words Wednesday than with a message from our beloved Nina, who finds wisdom on Chicago's El. She is leading our launch plans as we prepare for our soon-to-be announced Grand Opening. Stay tuned! In the meantime, we're headed back for Round 2 at the wonderful Kit and Ace. Come meditate with us at their Fulton Market location 9:30-10:30am on Saturday, 3/18. Anxiety is an ever-existent presence in my life; a sentient thing that's always humming in the background, threatening to overwhelm me. But if you're brave enough, it can serve as an unexpected tool for self-growth. I've made peace with the fact that anxiety is part of me, deeply woven into the fabric of my being. When it rears its head, these simple actions are what cast out the fear. Keep them in your toolbox. Accept What Is: Anxiety, at its core, is you resisting what is. Things are happening that you wish weren't, or vice versa. Instead of going against the present moment, try leaning into it, no matter how uncomfortable it might be to do so. Practice Mindfulness: When a wave of nervous energy washes over you, push pause and engage in a mindful activity. (I find that the most powerful way to do this is to get out in nature.) Step away and go for a mindful walk. What do you hear/smell/see/feel? Don't label these things, just observe and feel. Noticing our thoughts, feelings, and emotions is key to being in the present moment. Make Space for Uncertainty: Anxiety is really a fear of uncertainty, of not knowing. As humans, we're wired to fear unknown outcomes. In response, we often catastrophize (i.e. assume that the worst possible scenario will play itself out). It can be hard, but try trusting that not knowing is part of the process - and that's okay. Drop Into Your Body: At the onset of anxious feelings, do a body scan*. Close your eyes and drop into your body. What physical sensations do you feel? Without labeling them, simply allow them to be there. Allow Yourself to Feel What You Feel Without Judgment: Getting angry with your anxiety is an all-too-common response. ("What's wrong with me? Why can't I be normal?) It takes some practice, but being kind to yourself is crucial. If your dearest friend were feeling this way, what would you say to him/her? Keep your self-talk as compassionate as possible. Make Meditation Part of Your Routine: There's a great Zen saying I love: "You should sit in meditation for 20 minutes every day - unless you're too busy; then you should sit for an hour." Such wisdom in these words! Let our meditation series be your entry point. Marianne Hayes is a breathe bar guest contributor. She's a longtime freelance writer with a passion for spiritual growth and inner life. Mindfulness is a buzzy word these days, one that pops up frequently in the meditation and yoga communities. Mindful living has become the aspiration of many, but what does it actually mean? In its simplest form, it boils down to living a life that's more responsive than reactive. It's about paying attention and allowing things to be as they are, without judgment or resistance. Given its definition, it isn't surprising that mindfulness can be a powerful tool for coping with stress.Jon Kabat-Zinn, the founding executive director of the Center for Mindfulness in Medicine, Health Care, and Society at the University of Massachusetts Medical School, has been a pioneer in this space. I just love his definition of stress: "...stress really has to do with wanting things to stay the same when they are inevitably going to change." Zinn is definitely onto something. According to Harvard neuroscientist Sara Lazar meditation can have a profound effect on our brains, specifically in areas related to fear, anxiety, compassion and empathy. Her research also suggests that meditation might even slow down the effects of old age. MBSR and mindful living are built on the idea that there really is no such thing as multitasking, something echoed by a slew of neuroscientists. The mind is designed to focus on one thing at a time; "single-tasking," if you will. Meditation is the ultimate single-tasking activity, often nudging us to pay attention to our breath and really feel our bodies. It requires us to be fully present for the experience. Thoughts are inevitably going to drift in and out of our awareness (we're only human). Meditation doesn't ask us to empty our minds of these thoughts; it asks us to create space for them, then let them go, gently releasing each thought like a balloon floating into the sky. Drop in and let go during our next breathe bar pop-up on February 11 at Kit and Ace. Our rockstar attorney turned mindfulness teacher Judy Craven will lead us in a guided meditation, followed by a granola sampling from our friends at No Denial Foods. We have a few spots left! RSVP: westloop@kitandace.com. And our Meditation Mondays at Venue One Chicago are a great way to start the week! Registration required. As we all know, embarking on any new endeavor requires a village of support and resources to come to fruition and be successful. breathe bar is fortunate to have one of the country's best MBA programs, Northwestern University's Kellogg School of Management, in our backyard. Through their strong experiential learning program, we are fortunate to have two amazing students leading some strategic initiatives for us. Please meet Marco and Dan, who inspired our cool header image. We're grateful to have their expertise (and their patience as I learn to embrace Excel). They are socially-conscious, whip-smart and mindful business leaders (by the way, see the latest from Harvard Business Review on the topic). We're also overflowing with gratitude for our newest intern, Mariel, a Columbia College Chicago student whose creative juices and graphic design prowess infuse our social media and digital marketing efforts, guided by our fearless leader Raquel. Mariel's handiwork is throughout this newsletter. Speaking of great people, we're hiring a Studio Manager for our West Loop location, launching soon. Details here and referrals appreciated. Last but not least, tickets are still available for our Saturday special this weekend. Meditation + yummy Garden of Flavor juice flight + juice giveaway, 8-9:30am at Mariano's West Loop, 40 S. Halsted, Chicago. It's our last class in this series, so come check it out! Just $5! Register here. We look forward to seeing you soon! Exciting events are in the works for February - we'll be introducing guest meditation teachers for special Valentine's Day and mindfulness-themed classes during our Monday night meditation at Venue One Chicago, and will be popping up at neighboring indie businesses for special events. As always, you'll be the first to know the latest news. We do much to care for the ones we love. We offer warm embraces, patience, and understanding. We cook nourishing meals, give gifts, and express gratitude. But do we do the same for ourselves? Self-care is one of those things that, if we're not mindful, gets pushed to the wayside. But as photographer Hannah Mayo so beautifully puts it, "It is not selfish to refill your own cup, so that you can pour into others. It’s not just a luxury. It is essential." Such wisdom in these words. I believe that we all have this knowing, that we are at our best—creatively, physically, mentally—when we're taking good care of ourselves. The ancient health system of Ayurveda tells us that the four seasons can greatly inform our self-care routines. With winter in full swing, now is a great time to reexamine the ways in which we care for our own mind, body, and soul. Eating nutritious foods, getting out in the sun, when possible, and regularly moving your body are key to staving off the winter blues. Another crucial ingredient for optimal self-care? Keeping up with a daily meditation practice. (Our weekly meditation series can help you here.) I've come to regard my own routine as the most powerful self-care tool in my arsenal. What's yours? Share your tips on our Facebook page for a chance to win a copy of Eat, Taste, Heal: An Ayurvedic Cookbook for Modern Living. 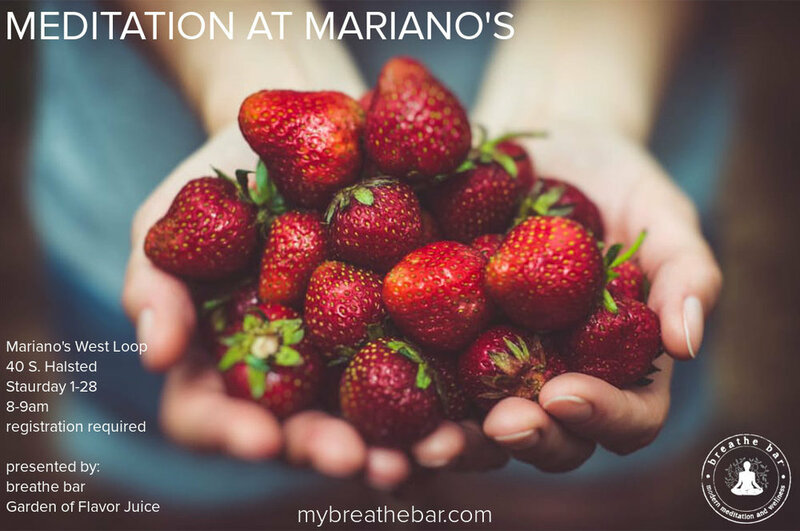 Marianne Hayes is thrilled to join the breathe bar team as a guest contributor. She's a longtime freelance writer with a passion for spiritual growth and inner life. With our political climate being as tense as it is, finding common ground with others—neighbors, friends, family—can prove a challenging task. The election may be behind us, but its polarizing aftermath is still an open wound. So how do we heal and move forward with loving kindness? The answer, I believe, is with compassion. But, as we all know, demonstrating it can be easier said than done. As we come together to honor Dr. Martin Luther King Jr. this month, his reverence for nonviolence feels especially relevant. Compassion is one of the most powerful ways to bring love and light. I had the good fortune of listening to negotiating expert William Ury on a recent episode of NPR's TED Radio Hour. 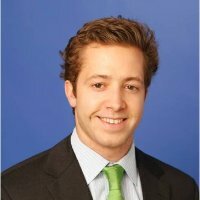 A Senior Fellow at the Harvard Negotiation Project, Ury is also a longtime mediator and negotiation adviser. For him, healing the divide is all about finding what he calls the third side of the conflict. "What we don't often seeis that there's always a third side, and the third side of the conflict is us; it's the surrounding community, it's the friends, the allies, the family members, the neighbors, and we can play an incredibly constructive role," says Ury. This third side, it turns out, depends on compassion. If we're capable of listening to what lies beneath opposing positions, we're then able to embrace the other person's concerns and proceed as one. In other words, it's about taking an empathetic approach instead of a combative one, which can have a profound ripple effect within our communities. 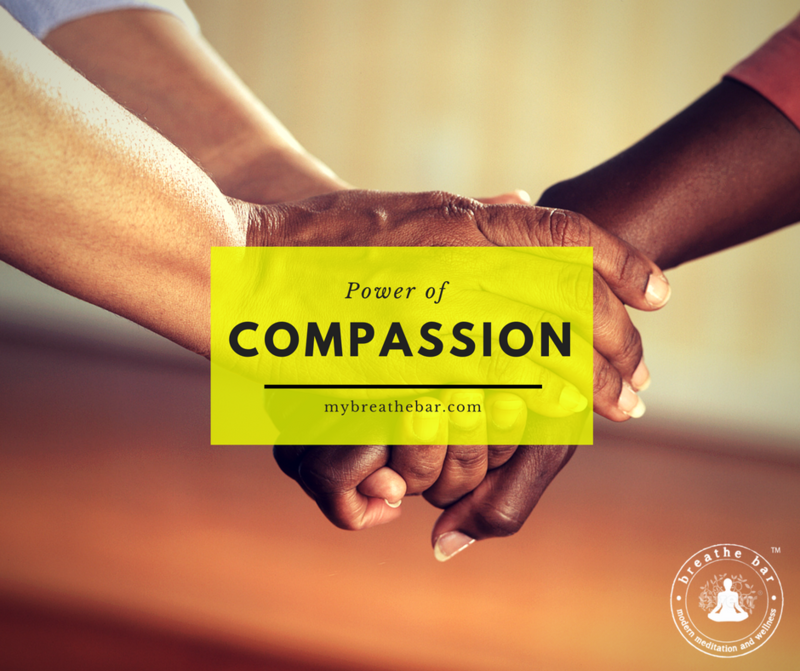 Research has already shown us that compassion is very well contagious. What's more, compassion meditation literally changes the brain for the better. It all starts with you. Drop into an upcoming breathe bar meditation class and give compassion a try. We're also working on a special peace & love meditation event on Friday, January 20, recognizing Inauguration Day and Martin Luther King Day. Stay tuned! We can't wait to spread compassion with you. As we enjoy day 2 of the new year, we have a short and sweet message. Do something good for you. Want to get started now? Join us tonight for Monday night meditation at Venue One. Register online with promo code: bbobogo2017 for today's class, or any class this month, and bring a friend free. How's that for doing good? We're sharing one of our favorite poems. It's our new year's blessing to you! New Year's resolutions get all the hype this time of year, but we'd argue that now—specifically tomorrow, December 29—is actually the best time to set your intentions for the coming year. Why? Because today marks the last new moon of 2016, making it a particularly ripe moment for manifesting our desires. An intention is an altogether different animal than a resolution; rather than springing from the ego, it's born from the stillness of our being—a true intention is an echo of the heart itself. The new moon is said to be the most powerful time to set new intentions, especially since this week's also comes right after the winter solstice. Elephant Journal points to the idea that the increased gravitational pull naturally makes us feel both stable and grounded, which, in turn, allows us to dive deeper into our own inner life. So how do we set intentions that stick? A few months ago, I earmarked this bit of wisdom from Deepak Chopra. You can bet I'll be putting these five steps into action on this evening. 1) Slip into the gap: He's referring to the state of pure consciousness we experience through meditation. Need some help? Our New Year's Eve morning meditation can provide some gentle guidance. 2) Release your intention: Chopra suggests freeing your specific intention in the quiet moments just after mediation. 3) Remain centered in a state of restful awareness: Tune into what Chopra calls your "higher self" so that you don't fall victim to doubt. 4) Detach from the outcome: Let go of all expectations of how your intention "should" be fulfilled. 5) Let the universe handle the details: You're no longer in the driver's seat. Be open to however the universe manifests your intention without trying to manage the details. The final step, of course, is to receive with joy!